Enjoy your dream vacation amidst tropical nature! 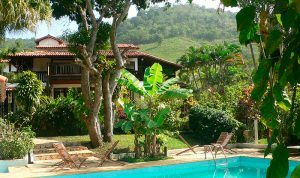 Holiday in Paradise - amidst lush tropical vegetation, just 80km from Rio de Janeiro and 8km from the beaches of Saquarema. The Costa do Sol is known all over Brazil for its beautiful landscapes with rainforests, mountains, vast lagoons and endless fine and clean sandy beaches. Our farm hotel can offer you what you need - peace and quiet, fun, enjoyment or adventure – whether you’re travelling alone, as a couple, with friends or with the whole family. Celebrate your party in paradise!